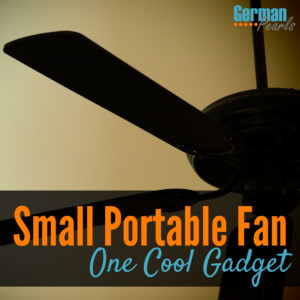 If you’re looking for a small portable fan you have to check out this cool little gadget! A friend of mine has been experiencing hot flashes lately and was given this little personal fan as a gift. I was blown away by the sheer genius of the idea. If you’re looking for a portable fan you’ll want to see this. If you’ve been looking for a personal fan you probably want a portable battery operated fan. But, this little fan doesn’t need a battery – and you don’t have to plug it into a wall outlet. The genius of this product is in the simplicity of it. 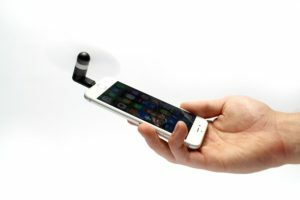 This small fan has a connector that fits into your smartphone. So, it’s your phone that provides the power. To turn the fan on, you simply plug it into the power port of your phone. To stop the fan, simply unplug it. This personal fan is being powered by your smartphone so you’ll need to keep an eye on your phone’s battery. But, if you carry a portable charger you won’t have to worry about your phone’s battery dying. See Also: 10 Ways to Improve iPhone Battery LifeAnother great part about this fan is the price. For an awesome price you can have a personal fan with you at all times. You can get this portable fan in fun colors for your iPhone, Android or with an adapter so you can use it with either device. This fan is turning out quite handy for my friend and is so cool (pun intended) I might be buying some as stocking stuffers. If you have one I’d love to hear how you like it. Also, what other cool gadgets have you come across lately? Leave a comment below so I can go check them out!